Since April 2015, EU dairy farmers can expand milk production without facing restrictive milk quota constraints. This opportunity has been well received in Ireland and milk output has increased by 30 percent since quota abolition, mainly achieved through expansion on existing farms. The Irish dairy sector’s remarkable growth rate began once milk quota abolition was confirmed in 2008, as a ‘soft landing’ policy allowed gradual increases of milk production prior to milk quota abolition. 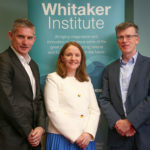 It was in this context that the Irish government launched the Dairy Efficiency Programme, which was designed to achieve efficiency gains in the dairy sector through technology transfer. Participation in advisory-led discussion groups was financially incentivized for three years (2010–2012). However, discussion groups had been in place since the mid-1990s. Previously, about a quarter of Irish dairy farmers were involved, while participation rose to about 50 percent due to financial incentives and impending quota removal. Moreover, Ireland announced in 2010 an ambitious growth target, aiming to increase its milk production by 50 per cent by 2020. Irish dairy farmers had time and policy support to prepare for a quota free production environment. This research documents the effect of farm advisory efforts during the run-up to quota removal on Irish dairy farm adjustments.